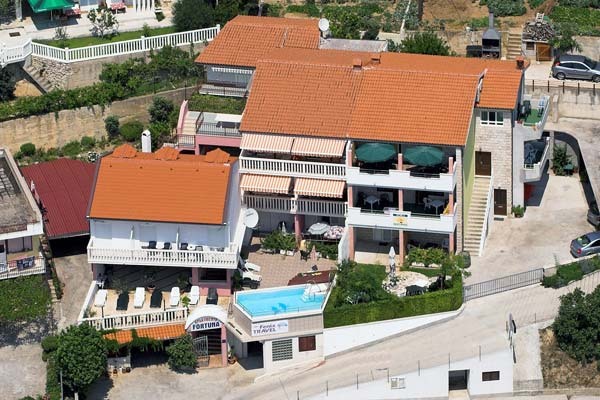 Apartments Fortuna are situated in a small tourist place Ruskamen, located on the shore of beautiful Riviera Omis. The house is situated above the main road, in a very quiet neighborhood. About 120 meters from the house is a beautiful pebble beach, which can be reached by promenade. In front of the house is a large courtyard on which guests can enjoy the view of the Adriatic Sea. The house is accessible by vehicle and garage for guests is located below the house. Center is distanced 50 meters from the house, while café and restaurant are distanced 20 meters. Homemade wine, orahovica, brandy and other local delicacies can be bought from the local people in the vicinity. If you choose to spend your holiday in apartments Fortuna be sure to visit the city of Omis distanced 6 kilometers from the apartments and city of Split that is distanced 30 kilometers from the apartments. In the accommodation offer is eight apartments. Each apartment is equipped with air-condition. The use of air-condition is unlimited and free of charge. Clean apartment, fresh bed linen and towels are waiting guests on arrival. On departure guests are not obliged to clean either arrange apartment. For guests who stay longer than 7 days in the apartment fresh bed linen and towels are handed by the host every 7th day. Minimal period in which apartment can be leased is 7 days. The apartment is available from 12:00 PM on the day of arrival until 10:00 AM on the day of departure.